Jaguar unveils a more potent version of its most practical model, the XFR-S Sportbrake is powered by a 542bhp 5.0-litre supercharged V8. Jaguar has kept us guessing about whether it would build a high-performance XF Sportbrake, but we now have an emphatic answer. Rather than simply building a XFR Sportbrake, Jaguar has skipped straight to XFR-S specification for the most practical model in its range. Set to arrive at the Geneva Motor Show, the Sportbrake joins the XFR-S Saloon and XKR-S as the third member of the ballistic R-S family. Like its siblings it uses a 542bhp 5.0-litre supercharged V8 producing 680Nm of torque – enough to rocket it from 0-60mph in 4.6 seconds, 0.2 seconds slower than the XFR-S Saloon, and on to an identical top speed of 186mph, despite weighing around 90kg more. Jaguar’s designers have translated the Saloon’s pumped up styling into the Sportbrake’s more sensible bodystyle, minus the wild rear wing of course. It does get a much smaller roof spoiler though, along with a deeper front bumper and front splitter to boost downforce at high speeds. Extended and more sculpted side sills, a deeper rear bumper, 20-inch alloys and a race car-style rear diffuser complete the exterior updates. Inside there’s sports seats covered in stitched carbon leather and a sprinkling of R-S badges, but the Sporbrake’s impressive interior space remains. That means 60:40 split folding rear seats and a boot that extends to 1,675-litres with the seats down. Although the XFR-S Sportbrake uses the same basic chassis as the XFR-S Saloon, the rear suspension has been tuned specifically to cope with the extra weight. Thanks to stiffer anti-roll bars, firmer springs and dampers and a new front suspension knuckle, overall ride stiffness is up by 30 per cent compared to the standard car. Wider tyres, bigger brakes and an electronic differential should ensure it goes, stops and turns just as well as the Saloon. It won’t be quiet either – the central silencer in the exhaust has removed and replaced with an ‘X-piece’ for a booming exhaust note and crackles on the overrun. Jaguar has also made changes to the standard XF range - introducing a R-Sport model. It gets the looks of a performance model, with a chunky bodykit, but is only available with the 161bhp 2.2-litre diesel engine returning 57.7mpg and 129g/km. 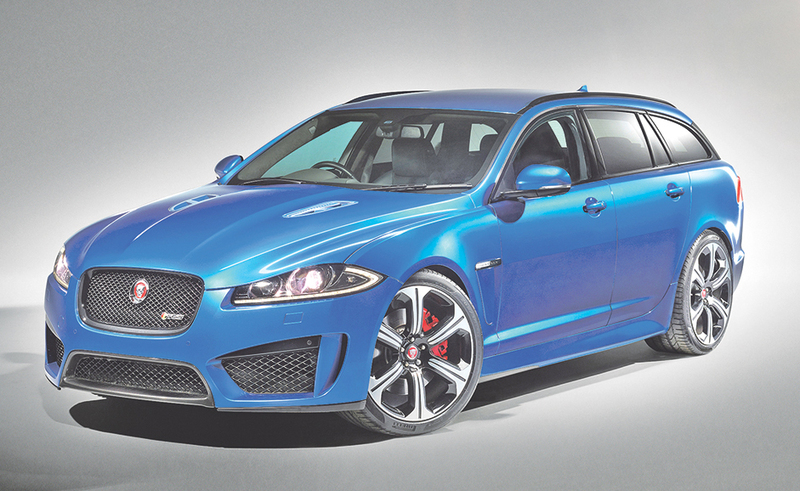 Order books for the new XF models open on April 1, with the XFR-S Sportbrake priced at £82,495. Its closest rivals will be the Audi RS6 Avant and Mercedes E63 AMG Estate.